Mendenhall Glacier as seen from Thunder Mountain. That’s me in the 1993 image. For a bit of a sense of scale: the distance from Nugget Falls (waterfall at lower right) to the terminus in the 2010 image is slightly more than 1 kilometer (0.62 miles). Mendenhall Glacier photographed from Thunder Mountain in September of 2010, 2011, and 2012. Photos by Jack Beedle. The retreat from 2010 to 2011 is apparent, but it’s difficult to make out much change in the past year from this distance. Within the next decade it’s likely that Mendenhall Glacier will retreat to a point where it is no longer in contact with Mendenhall Lake. When this happens the calving process – by which glaciers can lose large amounts of mass – will end, and the retreat of Mendenhall Glacier should slow. Are we nearing that point? 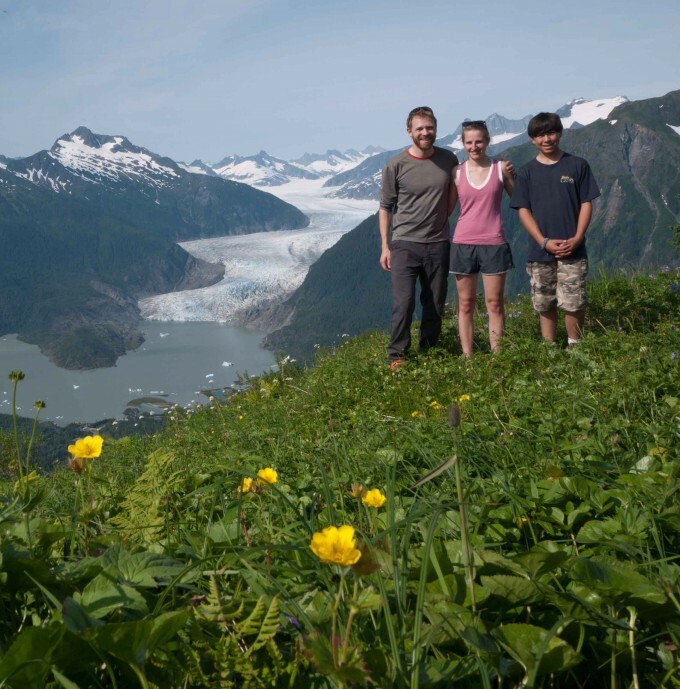 Did retreat of Mendenhall Glacier slow this past year? To try to answer these questions I did a quick investigation with satellite imagery from 1993, 2010, 2011, and 2012. These two images are from Landsat satellite imagery. I used what are called false-color composites that show vegetation as red, and make the glacier ice a bit easier to see. The unfortunate black striping in the 2012 image is from a failure of what’s called the Scan Line Corrector on the Landsat 7 satellite. The outlines for Mendenhall glacier in 1993, 2010, 2011, and 2012 are shown in progressively lighter shades of blue. In 1993 Mendenhall Glacier extended to Nugget Falls, where a popular trail ends today, and many people play in the sand where the ice stood not too long ago. Since then it has retreated dramatically, especially where in contact with the lake where calving results in the loss of a great deal of mass. Note that the retreat along the bedrock peninsula that juts out into the lake, where the glacier is grounded and there is no calving, is much less. To measure the rate of retreat since 1993 I took the average across the entire terminus, including the portion that calves into Mendenhall Lake and the portion that is grounded on the bedrock peninsula. Before I tell you the numbers I need to post a little disclaimer. Landsat satellite imagery, with a resolution of 30 meters (the width of each pixel represents 30 meters on the ground), is far from ideal to determine annual glacier length change. My intent here is to get a rough estimate of change to lend some context to the repeat photography. From these measurements it appears that recent retreat of Mendenhall Glacier (2010 – 2012) has been greater than the average rates since 1993. 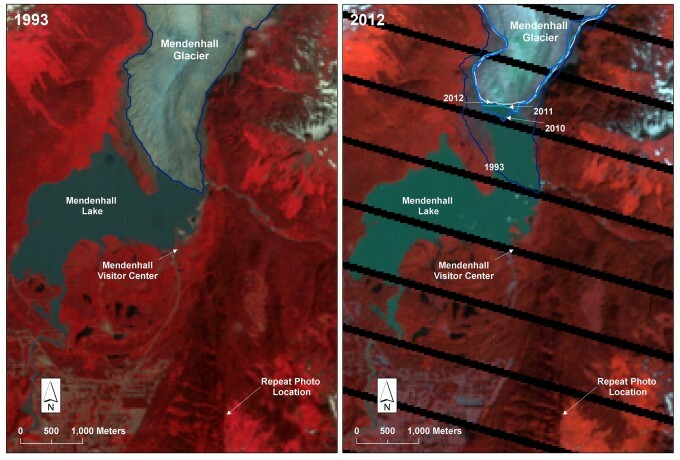 Although it’s not readily apparent from the repeat photographs, the retreat of Mendenhall Glacier has continued in 2012, and at what appears to be a rate that is a bit faster than the average since 1993. I too visited this site on Thunder Mountain this past summer with the intent of getting a shot of me standing in the same place as in 1993. Unfortunately I didn’t have the right lens in my camera kit that day to get the same perspective that was captured in 1993. I hope to return to Thunder Mountain with my dad in the summer of 2013 to capture the ’20th anniversary’ shot of our initial journey to this spot. Me with cousins Jana and Shannon at the Thunder Mountain repeat-photograph site. August 2012. Standing on Thunder Mountain, 1993 image in hand, enjoying the stunning view of Mendenhall Glacier, I was struck by the incredible magnitude of change. Not really saddened, but more in awe of the incredible dynamism of the natural world around us. I’m captivated by these rapidly changing, intensely beautiful masses of ice and snow, and hope that I can bring a bit of this experience to you through images and a bit of analysis. Motyka et al. 2003. Twentieth Century thinning of Mendenhall Glacier, Alaska, and its relationship to climate, lake calving, and glacier run-off, Global and Planetary Change, 35, 93-112. Because I will soon be visiting Mendenhall Glacier again I was interested in understanding the retreat. Thanks for the photos and calculations.